Are You Wanting to Learn to Play the Harmonica? Hi, my name is Jay McMullan. I remember buying my first harmonica when I just a kid, probably around ten years old in my small hometown in the Texas panhandle. I bought the harmonica and had no idea how to play it. I puffed around on it for awhile and could not tell you what ever happened to it. Later in life, I taught myself to play guitar out of necessity. I was pastoring a church in south central Texas and I needed to be able to play the guitar for our worship services. One of my church members played guitar when he was available but he worked on off-shore drilling rigs and was only home every other two weeks. I made a deal for a cheap acoustic guitar at a pawn shop, he showed me three chords, D, G and A and I practiced and practiced and practiced to the point where my fingers would bleed but I finally taught myself how to play. I played for a few years but then I went for a number of years that I didn't play at all. Around 2006, I picked my guitar back up and dusted off the cobwebs. I started writing some songs and I bought a harmonica again. I just never could get my harmonica to sound like other people I heard and I was frustrated with it. I moved to Florida in December 2008 and started delving a little deeper into the harmonica. With the advent of Youtube, we have FREE lessons to almost anything on earth! It is fascinating to me. But, there were things and terms I did not understand like, which key of harmonica to buy, why are there different keys available in harmonicas, what is "cross harp", what is meant by 2nd position and third position? If you have a question that I don't have an answer for or if you still don't understand after reading my answers, please contact me. Blues harmonica has such a rich southern heritage. This is a wonderful documentary on Peg Leg Sam. "Huey Lewis (born Hugh Anthony Cregg III; July 5, 1950) is an American musician, songwriter, and actor.
" 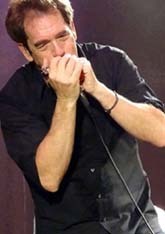 In an interview with David Letterman, Lewis talked about hitchhiking across the country to New York and how he learned to play the harmonica while waiting for rides. He talked about hanging out at the airport for three days until he stowed away on a plane to Europe. In future interviews Lewis would reveal other encounters while traveling Europe. While visiting the British city of Aberdeen, Scotland, with no money and nowhere to sleep, Lewis claimed that the locals were very hospitable and would often offer him somewhere to stay. 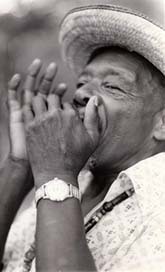 In Madrid, Spain, Lewis became an accomplished blues player and he hitchhiked around and supported himself by busking with his harmonica. He gave his first concerts in Madrid, earning enough money to buy a plane ticket back to the USA." © All images, graphics, photographs, videos, teachings, lessons, text, etc. on this website are the exclusive property and copyright of Jay S. McMullan, unless otherwise specified. Do Not Use any material on this site without the written, expressed permission of Jay S. McMullan and or his designees. Most videos featured on this site are not the property of Jay S. McMullan or this website. They are used in accordance with fair use laws. If you have the rights to a video and do not consent to its use, it will be removed within 48 hours of your notice.